With over 8.000 kilometers of coastline, Turkey has plenty of beaches. But as a holidaymaker, what you want is to find the best beaches in Turkey. And luckily for you, you are spoiled for choice, as Turkey has some of the most amazing beaches in the world. Get ready for a tour around what we think are the best beaches in Turkey, and keep the map at the end of this post as a reference to find them easily. As a bonus, we plan on adding more beaches as we visit them. Ölüdeniz is probably Turkey’s most famous beach, located near the popular resort of Fethiye. The beach with its adjacent lagoon is featured on many campaigns and the iconic photos of paragliders floating above this sea of turquoise added to its fame. Admittedly, the place is of a stunning natural beauty. Of course, with its popularity come many tourists. As with the other popular beaches on this list, we prefer Ölüdeniz in winter, but if you’re after a gorgeous setting and state of the art facilities for your beach holiday in Turkey, this place is definitely one to consider. You have several options to choose from during the season, the main part of the beach, Belcekiz beach, is public. The central part of the lagoon is a natural park where you will be charged an entrance fee, even in winter time. The back of the lagoon is private beach heaven. Most of these beach clubs even offer pick-up services from your vacation rental or hotel and have excellent entertainment facilities, sunbeds, kayaks and wining and dining options. On a more serious note; do you know the legend of Ölüdeniz? As with many a legend, there’s a love story involved. A girl called Belcekiz fell in love with a handsome boy. He was the son of a captain and they met as he went on land to get drinking water for the boat. Sadly, he had to return to the ship and Belcekiz watched it sail away. She would wait for the boy to come back, and each time, they spent time together. When a storm blew up one day, the boy said to his father he knew of a perfect shelter. A cove where the waters were as still as a pond. The captain was well aware of his son’s love affair and thought the advice was just an excuse to see the girl. An argument followed and the father hit his son with a paddle causing the boy to fall into the rough sea. Not much later, the ship had drifted to an extremely tranquil inlet and the captain realized his son had told the truth. The body of the boy was found on the rocks after which Belcekiz jumped onto the rock to commit suicide. The beach is named after the girl, the place where they died is now Ölüdeniz or dead sea. You’ll find Kaputas beach along the scenic coastal road between Kalkan and Kaş. It is a small beach that has gained fame after people shared some glorious shots of its turquoise waters on social media. The beach is formed by a gorge opening out into a stretch of sand. Take a countless number of steps down and enjoy this slice of paradise. During the summer months, the beach has facilities, including sun loungers, parasols, and catering. Unfortunately, this also means crowds. To us, this is a place we enjoy out of season when it is deserted and the dominant factor is the natural beauty, and the turquoise water. 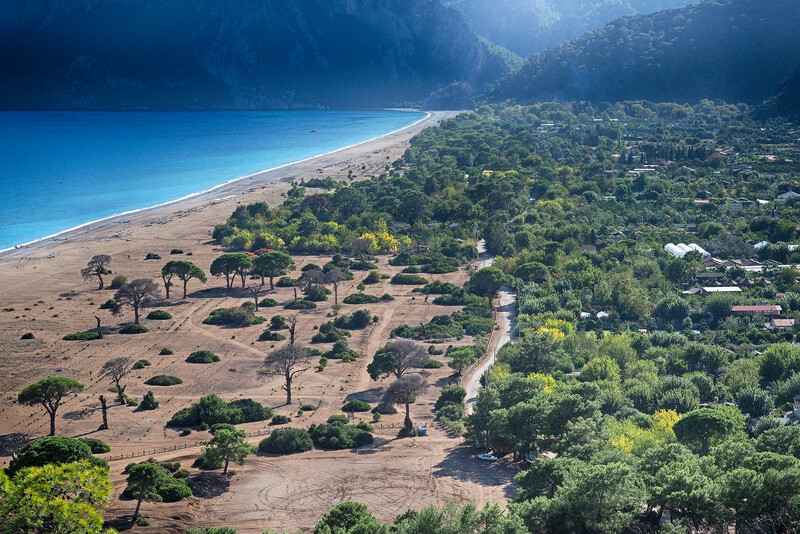 Iztuzu beach near Dalyan is also known as turtle beach. The reason is obvious; this is one of the last breeding places in Europe for the protected Caretta Caretta or Loggerhead Turtle. The beach is a sandbar at the end of a delta and is a national conservation area. This is a large sandy beach in a scenic environment with a small café and sun loungers during the season. There is also a Sea Turtle Research, Rescue & Rehabilitation Centre on the beach where you can learn all there is to know about the protected sea turtles. During the months of June and July, the Loggerhead Turtle eggs are hatching just below the surface, and precautionary measures are taken such as forbidding the use of umbrellas at that time. You can access the beach by car (there is car parking) or take the dolmuş boat from Dalyan and enjoy a relaxing boat ride across the silted delta bordered with reeds. Cirali beach (or Çıralı in Turkish) is a glorious stretch of sand adjacent to Olympos ancient site with scenic mountains as a backdrop. There is a very laid-back atmosphere both on the beach and in the village behind it. If you are into cabins and tree houses, you will love this place! Çıralı beach is the perfect spot to while away the day and enjoy the simple things in life surrounded by pristine nature. Head over to the eternal flames if you want to experience more magic of mother nature! Patara is Turkey’s longest sandy beach. Located near the tourist resort of Kalkan, Patara is a protected area with sandy dunes and an ancient site to complete the experience. In another post, we said Patara is the most literal form of beach culture; for that reason alone, it belongs in this list of best beaches in Turkey. You have to pay an entrance fee to visit Patara, but you get a lot in return: 18km of beach, clean facilities and showers and a beach café run by the local council that uses the profit to maintain the beach. Yahsi beach (Yahşı in Turkish) is located on the Bodrum Peninsula. Its popularity is rapidly growing, and it is easy to see why. Yahsi has a bit of everything. It has the relaxed vibe that we love, inviting waterside dining options and a state-of-the-art council-run tea house with unbeatable prices at a prime location. You can read all about Yahşı and the other resorts on the Bodrum Peninsula in this post. What can we say about Butterfly Valley, near Ölüdeniz? Some call it paradise, others overrated. In all honesty, it may be a bit of both, depending on when and how you visit it. There is no denying it: Butterfly Valley is very pretty, postcard-perfect almost. And that’s a forte and a weak spot at the same time. Since it has been ‘discovered’, more people are visiting. Especially during high season, when all the boat tours have Butterfly Valley as a stop on their sailing route, it spoils things for us. If, on the other hand, you visit out of season, you will feel in paradise! And if you’re keen on seeing butterflies, put it on your schedule for June. Contrary to what some people think, butterflies aren’t around all year, there is a season for everything!  You can best reach Butterfly Valley by boat. read all about how to get to Butterfly Valley in this post. Kabak beach is located in Faralya, a natural area not far from Fethiye and popular Ölüdeniz beach. It is relatively untouched. The road ends in Kabak, which means people have to purposely make the trip up the winding mountain road from Ölüdeniz to Faralya. Still, it is becoming more popular each year, with more tourists making their way to Kabak beach. Kabak and Faralya are places for nature lovers. You’ll find lots of boutique style hotels and camping sites with a boho touch and yoga platforms. On the beach, there are sunbeds and a café, – restaurant – camping site during the summer season. If you are visiting Kabak beach, consider walking up to the hidden waterfalls located in the forest behind the beach. Sarigerme beach is quite close to Dalaman airport, though once there, you feel as if the only thing around you is nature. The beach is well-kept by a dedicated organization and is relatively unspoiled due to its distant location from any major tourist resort. This is a lovely and long sandy beach, with car parking at the entrance. There is an entrance fee for access to the beach. 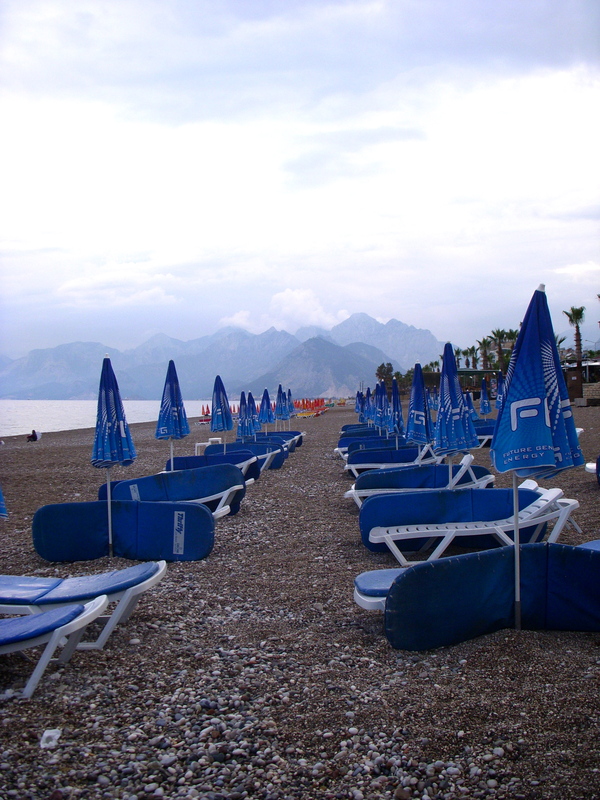 Konyaalti beach is on the list because we simply love the fact that this beach is located in a big city like Antalya. It is the cities’ beach, and unlike Lara, it isn’t sided by exclusive all-inclusive hotels. The beach is mostly pebbly and stretches all the way to the Beydağları mountains. depending on what spot you prefer, you’ll enjoy any kind of beach facilities or almost total peace and quiet. And as soon as you get bored with the pebbles between your toes, you’re only one tram ride away from buzzing Antalya or charming Kaleiçi. Delikli Köy beach is situated at about 12km from Çeşme and at around 80km from Izmir. There are no road signs to this beach, which is only visited by locals. While the beach has no facilities, it has a lot to make up for that. The setting is amazing, with white, out-of-this-world rock formations that dominate the shore. This is the perfect beach for those who prefer to stay away from the crowded Çeşme and Izmir beaches. Having a list of the best beaches in Turkey is good, but a link to a map with all beaches in Turkey, including an indication of the quality of the water, is even better! As the icons are in Turkish only, here’s the translation to help you make the most of the map. We will also add each beach featured in this post to our map search page. 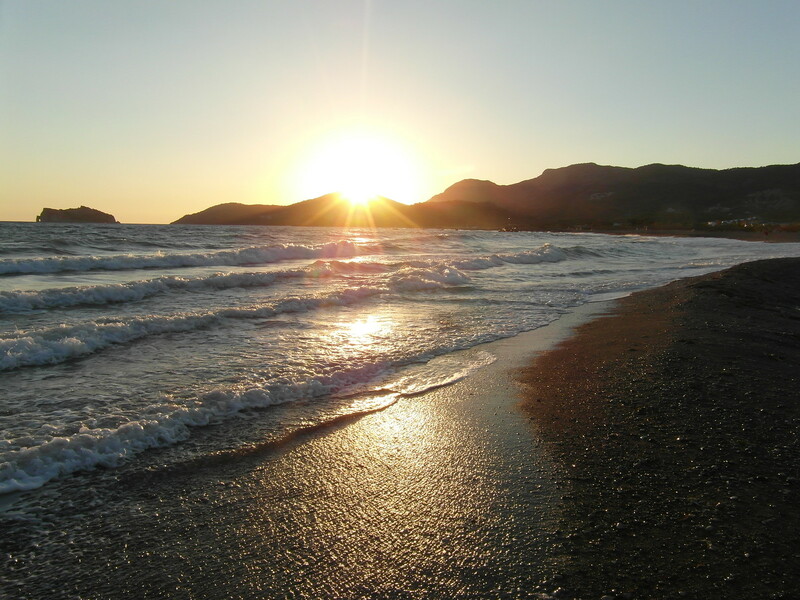 Remember that plenty of beaches in Turkey have pebbles or rough sand; wearing swimming shoes is always a good idea!